Not crossing this off my bucket list yet but I’m half way there! One of the things I wanted to do was sky dive and I can’t believe I did it but I did. I’ve always heard that the best places to go was Dubai or Hawaii; but since they’re too far and not really accessible at the moment, the next best thing for me was Santa Barbara! Sky diving has always been in the back of my mind. I’ve always thought that it’s just something I’d probably do later than sooner. However, my friend wanted to do it for his birthday and we’ve been talking about it for 2 years. He said he wanted to do it before his 30th but a 2 years lag happened lol. I was so excited and nervous at the same time. I just couldn’t wait to jump out of a plane but I didn’t really want to either. It was a weird feeling approaching to the day we would jump! I had only a week to prepare! During that week, I read various articles and watch many YouTube videos of people’s experiences. I wasn’t as nervous as I thought I would be at the day of the jump and based on this I kind of expected everything that happened except for a few things lol. Here are few things I’ve learned, some tips, and actual events. 1. DO YOUR RESEARCH. 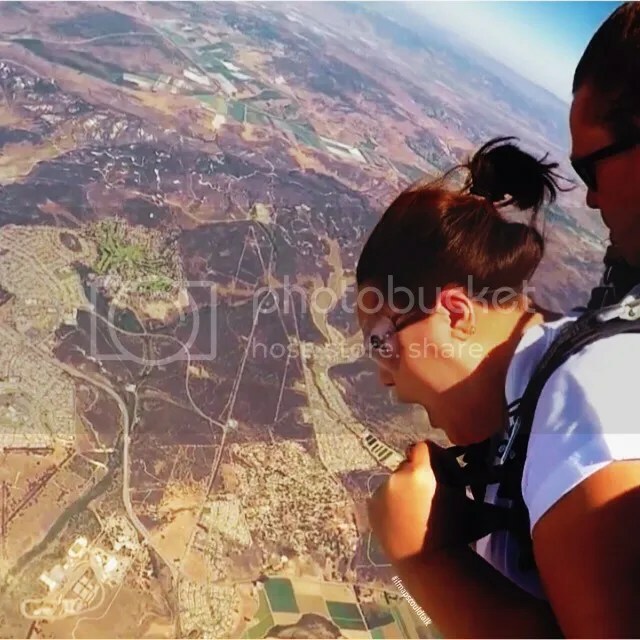 Your skydiving experience (if it’s your first one), will be an experience you will never forget. Make sure you find a skydiving place that will make it a SAFE and memorable one. You don’t want to end up 6 ft under. Read a lot of reviews about the place you are going to skydive and read other people’s experiences. Look to see the place’s safety record and see how many years this place has been in business, if applicable. My friends and I chose Santa Barbara because it was close to the ocean. Plus, by reading the reviews on Yelp! and other websites, that it had a great safety record. I read a lot of why people gave them a 1 star more than a 5 stars because I wanted to know why they didn’t have a great experience. Most of them were mainly because they were doing solo diving and the video wasn’t as great.But all of that are just perks compared to which place is going to keep you alive! If you see that some of their instructors are not certified and they aren’t professional, I would stay away! 2. If you decide to jump, make sure you DON’T BOOK IN ADVANCE! I went on a weekday (Friday) so it was easier to book at the last minute. The best time is to book at least 2 days before you go since you can’t back out. I believe sky diving is a impulsive sport. However, if you can handle your nerves one month out just to get a weekend spot be my guest! Some sky diving places make you pay a non-refundable deposit; approx. $50. If you decide to back out they will refund your money back but if you cancel within 2 days of your jump that deposit is non-refundable (Skydive Santa Barbara’s policy…other Skydiving places may differ). 3. It’s a WHOLE DAY thing. I left my house at around 8:00 am and came back around 5:30 pm. Santa Barbara is about 1 hour 30 minutes from Los Angeles, but Lompoc is another hour or so from Santa Barbara. Our appointment was around 11:00 am. After signing waivers and watching the mandatory videos, and waiting for the plane, we didn’t get to jump till around noon. We were recommended to do the appointment at the middle of the day because of the overcast. In the mornings, there’s a lot of fog that rolls into the area. You may wait longer; weather permitting. One thing that was a bit unexpected for me was that I didn’t see the ocean. The view was great but having an ocean view would be so much better. There was still an overcast when I went, but my friend did see the ocean when he did his jump at 18,000 feet! 4. You are SIGNING YOUR LIFE AWAY. When you first get there, they give you this 6 page document (back and forth) and you have to initial and sign every 2 lines down. Basically, this is telling you that if anything does happen to you, the Company is not liable for ANYTHING. The first video you’ll watch, you would want to listen to in detail, but it’s basically explaining everything you need to know in that document. The second video tells you what you should do before, during, and after skydiving. 5. THE JUMP. It’s probably the weirdest/amazing sensation you’ll ever feel. After you watch the video, they weigh you. Then you pay and then they strap you up. They do this whole video introduction thing (if you purchased the video). Then you walk to the plane. At Skydive Santa Barbara, they do have 3 levels in which you can jump; 8,000; 13,000; and 18,000 feet. I was comfortable with 13,000 feet because an oxygen tank was needed at 18,000 feet and I didn’t want all of that. Once you get up to the air, you have a last chance to back out but why would you? since you already paid the $200+ to get up there. The instructor finally attaches on to you, and you wiggle your way to the door. Take a deep breath, put your head back and he lunges out while your strapped onto him. 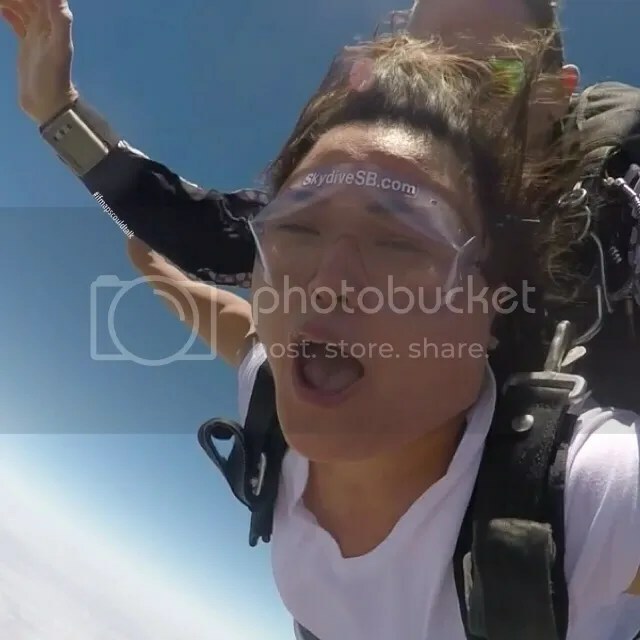 Your first gut reaction is to scream because you do have this falling sensation until you get into that flying position when your instructor tells you to put your hands up. After watching numerous videos and reading about this, I can honestly say that this is definitely an indescribable feeling. I have to say I’m not afraid of heights so I looked around everywhere. But when you’re in that position, you’re looking down and around and it feels like you’re not falling at all. The ground is just there and it doesn’t look like you’re getting closer. You are free falling but if feels like you’re not. It feels like the wind is keeping you afloat. Although it doesn’t last long till you get this jut from the opening parachute and you get this whole sigh of relief that your parachute opens! After your parachute opens, you pretty much gliding in the air for about 5 minutes until you make that “soft” landing. Unfortunately, my gliding in the air was a bit uncomfortable. I’m so happy that my parachute opened and I was securely attached to my instructor but my thighs ached so much in that 5 minutes. It felt like the straps were slowly riding on my thighs and every small turn we did just made it unbearable. BUT all in all I would totally do it again! (In a new destination of course!). 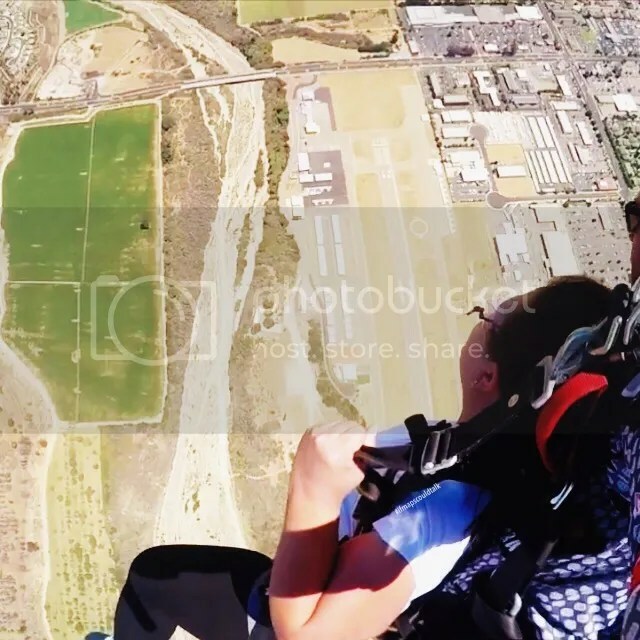 This entry was posted in Santa Barbara County, See and Do and tagged Santa Barbara, Skydiving. Bookmark the permalink.